Detroit’s Wolverine Packing Co. has opened a new, 180,000-square-foot, state-of-the-art meat storage and packing plant in Eastern Market. It is Wolverine’s fifth processing plant and contains its second freezer with a 20,000-pallet capacity. The company says it expects the new facility, which sits on a reclaimed residential neighborhood and expands the market district to the north, to bring new jobs to Detroit. It includes a four-acre park for neighborhood residents. With the option of building a new warehouse outside of Detroit, Wolverine owners Jim and Jay Bonahoom decided to continue investing in Detroit where the company was founded more than 80 years ago as a lamb and veal packer. Since then it has grown into one of the nation’s largest protein distribution companies. Today, Wolverine produces ground beef, value-added meat products, as well as fresh lamb and veal, and serves customers in all 50 states and in many countries around the world. The new Eastern Market facility was designed and built by cold storage construction company Tippmann Innovation of Fort Wayne, Ind. 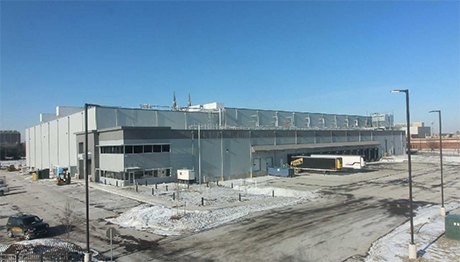 “What made Tippmann Innovation unique was not only their experience building cold storage and processing facilities, but also their ability to complete the civil engineering and brownfield assessments while communicating with the state’s environmental department to ensure everything was up to code,” says Jay Bonahoom, vice president of Wolverine Packing.